I am so sorry this came out today but due to illness I couldn't do it any sooner. I saw the season finally and yes Micheal Hirst tricked us again although did he? There are definitely difference between the European and American versions of Vikings.I have the opportunity to watch Vikings 3 times a week in the past. It couldn't be better for me. On Monday season 2 Dutch/European version, on Wednesday season 3 Dutch/European version and on friday season 3 UK/American version. While watching it I saw a lot of things I didn't recognise before or heard something different then I first hear or saw it. But in my opinion the show stays awesome to watch. 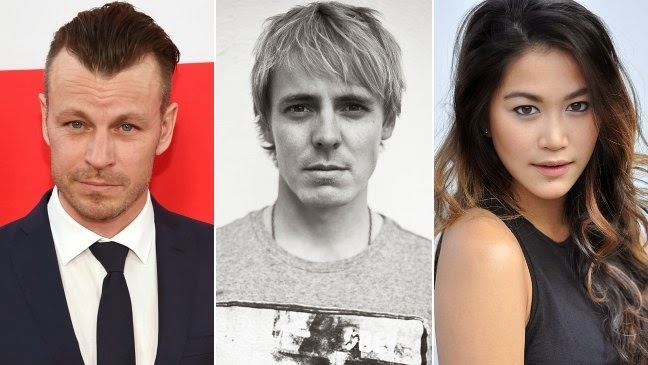 Alright this blog will take you trough the finale and some spoilers I read about season 4 also I like to point out that there are 3 new cast members added to season 4. That said let's go and do the finale blog. We start this finale with the bargain of the last episode I will remind you that the Frankia Emperor heard from Count Oddo that the supplies and food are low on stock so he decide to go to the Vikings to give them a bargain to go away, in return they need to leave Frankia as soon as they have the money. Ragnar on the other hand tries to get himself baptized what they did at the end of that Breaking Point episode. The money comes to the Vikings and Rollo is going to tell Ragnar. At that same moment Ragnar tells Rollo he is dying. Still Ragnar doesn't think about the money he is thinking about a plan. He also tells Rollo that he will meet Athelstan again. Floki however feels that Ragnar tricked by Athelstan and is ready to tell Rollo that Ragnar poisoned by Athelstan. Rollo is telling Floki that he will stay truth to the gods. Then Lagertha tells Rollo that the mind of Ragnar poisoned by his baptism but how could it be that Rollo got baptised and isn't poisoned. Rollo tells her that he saw it as a joke and that Ragnar only could be poisoned by one person Athelstan. Kalf on the other hand hopes Ragnar will die because there couldn't be a christian ruler in the Scandinavian. Or will the son of King Horik Elendur seek his change to kill Ragnar? unfortunately for him it will turn somewhat different from they expect. Oddo and Gisla what a couple they hate each other but there is still a kind of connection between them. Oddo is a crazy men we will see him in a 50 shades of count Oddo episode medieval style. Why haven't we seen that coming. Torture was pretty normal in that time but this is something I hadn´t forseen first. Then we have multiple conversations between the Emperor and Gisla. One of them is the victory of the Vikings. Gisla tells him it is no victory at all a strong but yet good conversation. Most of the conversations Gisla is a great influence on her dad but when he decide to give her a hand of marriage to Rollo Gisla looks like a spoiled teenager with fear of what will happened she compares Rollo with a beast that has no feelings. Boy we know better than that. 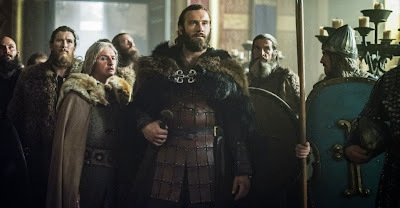 Rollo looks that way but we know he could be different.That is maybe the thing I like about Rollo a multiple character with surprises all over the place. I don´t know what is going to happen between Floki and Helga but it is sad in a way to see them both struggling with their relationship. Floki as we well know has killed Athelstan and he told Helga. She doesn´t know how to handle Floki anymore. A struggle we see back as he attack her twice this season. Helga is scared.Floki on the other hand tries to connect with her again on his own way the way we know only Floki could manage to do. 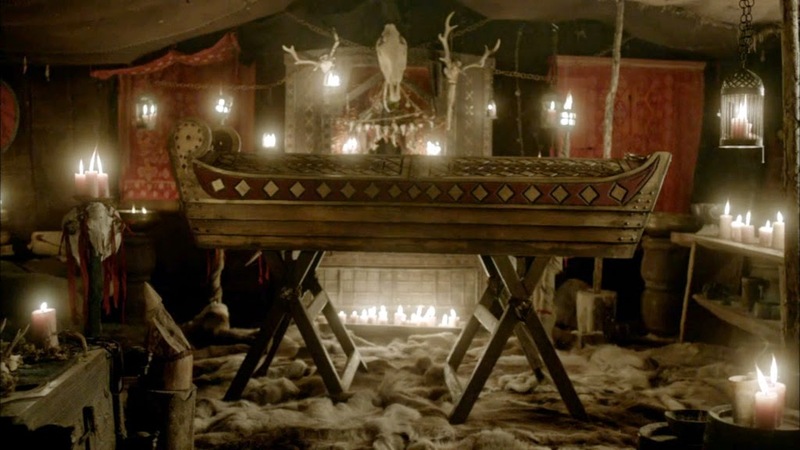 When he is making the last boat for Ragnar´s last journey Helga ask him in an impolite way what he is doing. She seeks a lot behind everything Floki is doing but also she tried to connect with him in a way. Ragnar and Bjorn´s conversation is one about power and how to rule. You rule with your head not with your heart. This is the last conversation between them before Ragnar dies the plan is than already set by Bjorn and Ragnar. Because we are a month further in time the Frankia´s are questioning why the Vikings haven´t left and are going to find out. Bjorn takes his responsibility and take them to see Ragnar.Bjorn ask them for a christian funeral and he gets it with unarmed Vikings to bring him inside Paris. That is a deal and all part of a huge plan.After they have left Lagertha goes to Ragnar although he didn´t see her she knows he will be dying soon. We now jump into the dead of Ragnar. Well played by Bjorn who tells everyone you could speak to Ragnar the coffin boat is already closed so no one could expect what is going to happen. We start with Lagertha what we know from this whole conversation is that she still loves Ragnar. Also that she thinks he will not go to heaven. She actually tells him that she thinks Odin will do whatever happens to get Ragnar into Walhalla because there is where he belongs. If he goes to heaven they will never meet again. Rollo is the most down to earth person in the talking to Ragnar. He tells Ragnar everybody will die some day. He never thought the gods would take him first. He also tells what he thinks everyone favorite you even the gods. You went from god to just a men when you died. In a way I didn´t saw Ragnar that way I had that with a few other persons. I saw Ragnar as a greatness but not as a god I still don´t know why. Floki is the one who actually give an anger speech. He is full with anger. Ragnar must understand it was Floki who build the boat to his fame and the last boat who will take him to heaven. Regards to Athelstan it could be a confession but is it really I don´t think so. Floki believes that Ragnar betray him in the end. Floki completely outnumbered himself in many ways in this conversation. He hate Ragnar in many ways but loves him too and he keeps asking the question why do you turn me away from myself. In the meantime Floki heard something and that is why he didn´t betray himself of killing Athelstan in my opinion. The funeral starts with 6 Vikings men who carry the coffin boat inside of paris then they carry it all the way to the cathedral. It shows us the difference between the Vikings way and the Christian way. The Viking music we hear while carrying the coffin is in my opinion traditional to the Viking way as we turn over to the church music the Christians will know as funeral music.I liked it because they showed the difference also in season 2 with the marriage scene of Floki/Helga and Aethelwulf/Judith. Funny thing is what happens next they are inside of Paris and out of no where the coffin hide a surprise of King Ragnar resurrection. It took the Frankia's by surprise. First he gets the Emperor but by killing the Cardinal first. After this surprise attack he takes Gisla hostage to get out of the cathedral not only that but he will give orders by not talking to Count Oddo he enables the bridge and so he makes his way through Paris. After they have opened the gate Bjorn gives a sign to start the raid on Paris. While everyone gets in to raid Paris he gets out to fall into the arms of Bjorn. While we see the surprised faces of the main characters they raid separately from each other to let them know he is still alive. He need to see their faces. When they have done raiding all get angry with Ragnar while Ragnar stay calm as always he tells them I got you into Paris that was the plan. He knows now how everybody thinks and who to trust and who not. The plan is to go to Kattegat for the winter and one person needs to stay. Bjorn asks for volunteers and it's Floki who wants to stay first. Then Rollo takes the lead into the conversation that Floki have much more to live for. So Bjorn tells Rollo to stay with warriors that wants to stay with him. When Rollo got audience the Frankia's emperor he got promised the highest rank Frankia has to offer Duke he gets land in the Northern of Frankia and above this all the hand of marriage of Gisla. As the seer has told to Rollo if he had known what the gods had in store for him he could dance naked on the beach. The return mission is to betray and keep Ragnar outside of Paris. No not again! Will he betray him this time only time will tell. In my opinion he can't betray him but that is mine idea. The funny thing about this scene is to actually see Rollo speak Franks "Je vous Salut" I had a laughter about that one. In the last scene of this season we see that Floki can't sleep like always when he is on the boat to Kattegat if Ragnar wakes from his sleep he ask Floki to come to him. The last sentence of this season "You killed Athelstan" is one to never forget and actually tells us Ragnar knew all along who killed Athelstan. What I like to see is that the judge stone in season 2 used for Floki. Kill someone with no reason is death most of the time but hopefully they will judge him the same way they did with Rollo in season 2. I hope Floki will stay because it is one big character I wouldn't like to lose just jet. There will be another time jump in the season. There are 3 new characters namely King Harald Finehair, Halfdan King Harald Finehair brother and Yidu. We will see more countries and old characters of last season. The boys of Ragnar will be grown up in a way. Yidu is a Mythology Chinese Emperor.